​Thanksgiving weekend, October 7th, 8th and 9th, 2016 was a fun-filled weekend to celebrate the 200th anniversary of the call to settle Valcartier, Quebec. For details of the activities that took place, see the information below. Come and listen to some of our talented local musicians play traditional music as we prepare to dance! The Valcartier Set and the Lancer were once danced at most every party and everybody knew these dances. Whether or not you have ever been “square dancing”, you are welcome to come learn, or relearn these local dances. All ages are invited, but parents must accompany children. Now that we have learned the steps, let's try it from the top! Family dancing until supper. The Honorable John Neilson will officially open the celebrations. Rumour has it that an old friend of his, Lt. Col. Alexander Wolff, may show up to really get the party started! In the olden days, the house parties would have a "lunch" served after the dancing, quite late at night. We will keep the traditional menu, but eat at a more reasonable hour. The cold supper will include sandwiches, turkey buns, pickles, squares, tea, coffee and juice. The bar will be open as of 5:30 pm. Supper will be free, but donations to support Oasis (to help the more needy in the village) will be appreciatively accepted. 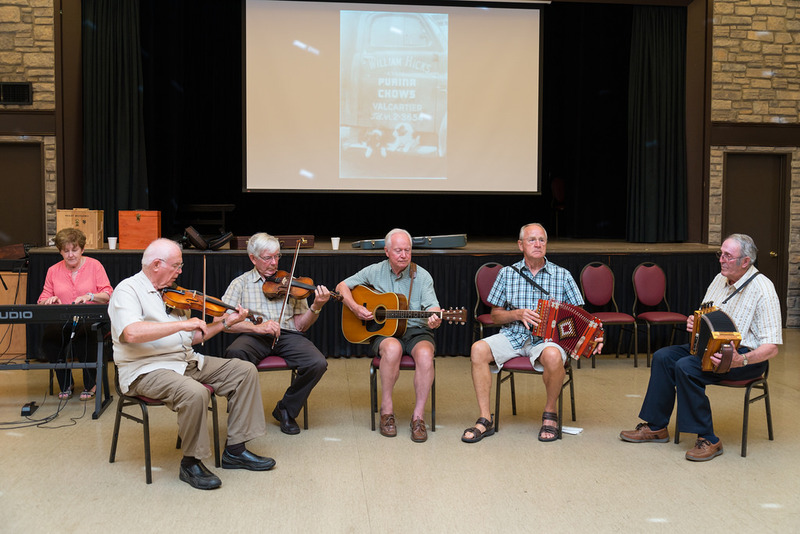 James Allan and his band will be joining us from Kinnear's Mills to 'call' our square dance evening. All dances are easy and will be taught. No experience is necessary. Come and enjoy some traditional music and dancing. Ethnomuseologist, Claude Corriveau, will be presenting the life of the Honourable John Neilson. Claude Corriveau was the researcher and creator of the exhibition "John Neilson, le Franklin canadien" which ran at the Centre d'interpretation historique de Sainte-Foy from Sept. 2015 - June 2016. Come learn why this remarkable man was considered the Benjamin Franklin of Canada. This presentation will be in French only. Come to the unveiling of a very special, but still top secret, project. Keep checking here for hints as to the nature of this project. All we can say for now is that even though John Neilson can't fathom the internet, we have some techno wizards among us... EVERYONE IS WELCOME! Kids and adults can test their skills in these traditional workshops! Spinning: Annie Blackburn is passionate about wool. Alpaca, merino, angora, llama... she shears, cleans, cards and spins them all. Watch or try it yourself. Annie will have a variety of wool and hand knit products. Continuous from 2 pm to 4 pm. Quilters: Join Beverly McKinley and Betty's quilters and learn to quilt with a simple project. Maybe the boys didn't have to quilt back then, but they are invited to try now. Dads too! Continuous from 2 pm to 4 pm. Baking: Whether it's called "Cakebread" or "Baking Powder Biscuits", it's one of the traditional treats of the village. Join Sally Lavallee and learn to bake this tasty treat, then taste it! Workshops start at 2 pm, 2:45 pm, and 3:30 pm. Costumes: We will have some costumes available to try on and take selfies. Why not wear your own costume? You may win a prize! A text from 1903 describes a magnificent house perched above the Jacques Cartier River. It was called "Riverside" and belonged to George Fairchild who served as host to many a country visitor. Exactly where was this house located? What happened to it? Was it the original "Riverside"? We'll pool all the information we have at hand to try and solve this mystery. If you know something, your presence is requested! There will be a family show with singer Daniel Roy at Valcartier Elementary starting at 4pm. Mr. Roy is a Quebec traditional musician and singer who includes the children in his show. Space is limited to the first 50 people. Also, tour the school and see what great changes have taken place over the years. The Valcartier Country Show was an annual event in the village for almost twenty years thanks to the late Roger Lamont and other local musicians. There were 22 shows in 17 years! Come and enjoy this less formal version of the Country Show with singers, musicians and songs from past shows. A display of photos and memorabilia will bring back the memories of those 22 shows. Fair warning: in the tradition of the village, music and dancing will continue into the wee hours! St. Andrew's United Church will have a service starting at 9 am. St. Gabriel's Catholic Church will have a service starting at 9:30 am. We will be offering free bus tours leaving from the community centre throughout the day. Please be prompt as space is limited. 10:00 am: Four churches - Visit each of the four Valcartier churches: United, Anglican, Presbyterian and Catholic. 12:30 pm: Valcartier traditions - Little known facts and a few surprises! 2:00 pm: Mont-Saint-Sacrement high school - Walk to the site of the Murphy and Monaghan homesteads or relax by the lake and take in the beautiful fall colours. You will also be able to see a mural that represents Valcartier, painted by the students, as well as the display case created by the archeology club of the artifacts found at the old Murphy and Monaghan homes. All four churches, Christ Church (Anglican), St. Gabriel's Catholic Church, St. Andrew's Presbyterian and St. Andrew's United, will be open to the public from 10 am to 12 pm. Feel free to ask questions, tour the cemeteries and take photos at your own pace. Local authors Marion Paquet and Julien Dubois, as well as musicians Eric Corrigan and Jimmy Kelly will be on hand to meet you, sell books and CDs and autograph them. Eric Corrigan and others will be available to answer questions, offer advice and help you find your "genealogic" way. If you have an interest or expertise in genealogy, please come join the discussion. Public Market: A market will be available with local artisans, jams, breads, soaps, etc. Information booths: Local organizations such as the Quebec Chronicle-Telegraph, Life in Quebec Magazine and Irish Heritage Quebec will have open kiosks. Family attractions: Check out the mini farm with pony rides and antique and modern farm equipment on display. Awarding of prize for best costume. Photo opportunities with John Neilson and Alexander Wolff and their descendants. We would love to see John Neilson and all of his great (+) grandchildren in one big photo. Same for Alexander Wolff --- yes, the rumours are correct that he will be joining us this weekend. Our photographer, Allison Kirkwood, will be there to take the photos which will, at a later time, be available to all. Could we really celebrate Valcartier without a traditional turkey supper? Since the demise of this annual community tradition, Fall has never been the same. So bring on the turkey and the trimmings just like it used to be!